Sydney Snelling: UNH has given me so many opportunities during my time here. One that I am most proud of is that for the past two summers I have been an intern at Lonza Biologics in Portsmouth, New Hampshire. 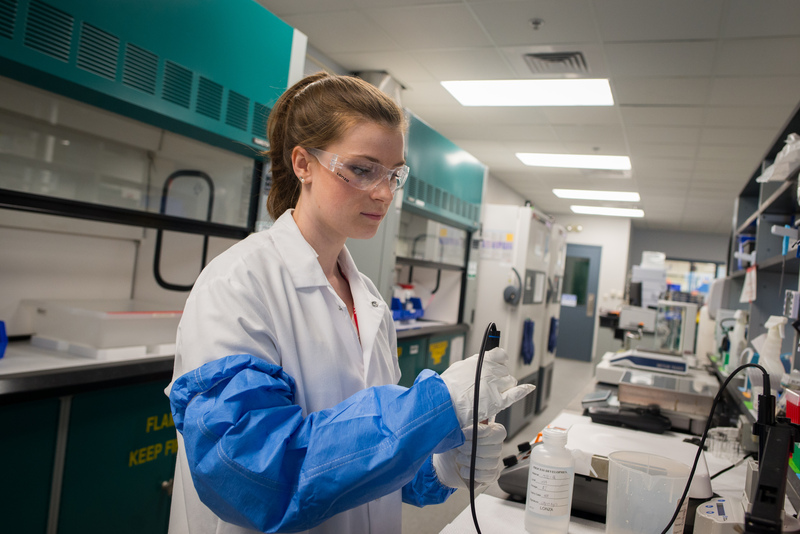 Being an intern gave me hands on experience and gave me an opportunity to put to use many of the techniques that I have learned in my classes and labs here at UNH. This internship was also very rewarding because it confirmed for me that the biotech field was one which I wanted to enter after I graduate. This opportunity gave me so many connections and experiences which will make it much easier when I start looking for jobs. Snelling: Because I am financially supporting myself through college I feel very motivated to do the best I can in all my classes. In addition to this, my family and friends push me every day to be the best version of myself I can be. Having this kind of support really inspires me to try my best at everything I do. Snelling: I've always known that I would end up majoring in something biology related, it was just a matter of realizing which sector of biology I was most interested in. When I was looking at programs the biomedical science: medical microbiology curriculum was the most interesting to me, and it gave me access to the classes and lab work that I felt would best prepare me for my future. Snelling: After graduation, I am hoping to get a job working in a lab at a biotechnology company. Snelling: From lab courses which have taught me a variety of different techniques that prepared me for my internships at Lonza to resumé help through the COLSA career office, UNH has been incredible at giving me the resources I need so that I am well prepared when I enter the work force. Snelling: Though medical microbiology can be tough, the countless experiences you are exposed to while in this major, make all the studying worth it. Through my four years here at UNH I have been given so many opportunities that I would not have had if I hadn’t been a part of this major. For anyone going into this major I would encourage them to take as many courses with labs as you can, because the labs are where you get the hands on experience with the organisms. My favorite classes during my time here have been Pathogenic Microbiology with Dr. Timothy Montminy and Mycology, Parisitology, and Virology with Dr. Juan Rojo. Both courses gave incredible detail and really convinced me that I was in the right major. Snelling: I love UNH because of all of the opportunities I’ve had here. I’ve been a TA in a microbiology lab, participated in research through the Haney lab, had an on campus job with some of the most supportive people I know, and participated in two fantastic internships through Lonza. UNH has given me wonderful professors and an incredible group of friends who have helped me to grow both as a student and person. I will definitely miss UNH when I graduate in the spring!